It’s simple really. No sewing needed! Cut two large circles – one from teal and one from red jersey. Cut slits around the edges of the circles, about 3 inches long and no wider than an inch. If you don’t cut them at the same time, be sure you cut the same number of pieces! Cut the face pieces out of felt and attach them using a good quality fabric glue. Knot the fringe pieces together, teal to red, and stuff the pillow before you’ve finished tying all of the fringe together. Voilà! 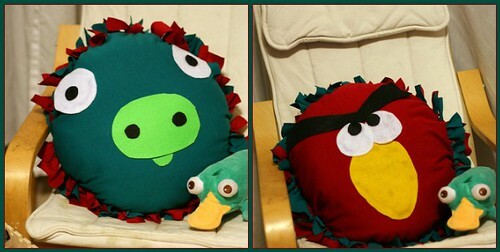 Angry Birds Pillow! Tagged Angry Birds, felt, glue, jersey, kids, no sewing, pig, pillow, project, red, teal. Not sure what sort of knotting you did on your fringe, but the blanket instructions suggested an overhand knot which looks really neat. I actually hadn’t thought of doing an overhand knot and I’m not sure I could have because my fringe was pretty short. I can’t take credit for the idea, I saw a photo of someone else’s Angry Birds pillow when I was looking for after school craft projects. I didn’t have any instructions though, so I made it up on the fly. Adorably brilliant! I love it.